Here is a great way to store your larger baits without dumping a load of cash on one of those fancy Musky tackle boxes. This size of box if you were to go out and buy it would be well over 100 bucks. 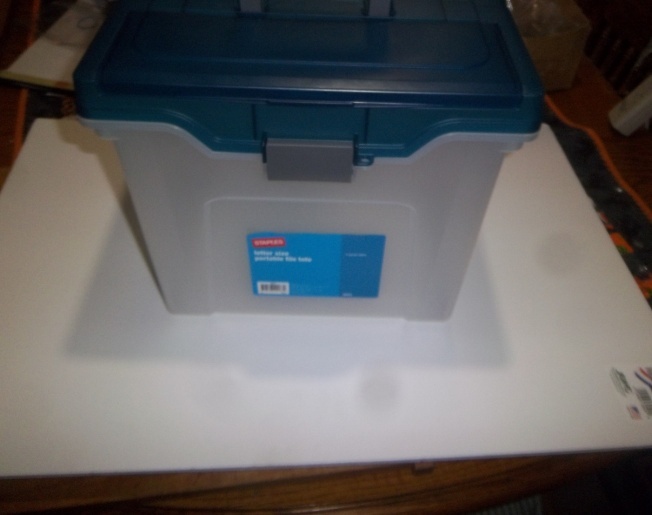 All you need for this is a Portable File storage box and 2 sheets of foam board. I got my File box from Staples for just over 6 bucks (you can find them at Wally world as well), and the 2 pieces of 20”x30” foam board from the dollar store. The only thing I did to the box it’s self was drill a small hole in each corner to let any water drain out. To put together your own box all you need to do is a little measuring and cutting and you can make a really cool big bait box for next to nothing. Since the boxes and foam were so cheap I ended up getting 2 boxes and 6 pieces of foam board to “PLAY” with. I started out by measuring the inside of my box both top and bottom as it tapers toward the bottom. I figured out the height I needed and marked out all my pieces with a marker. I test fit my cut pieces before I notched them to make sure they slide in and out easy. 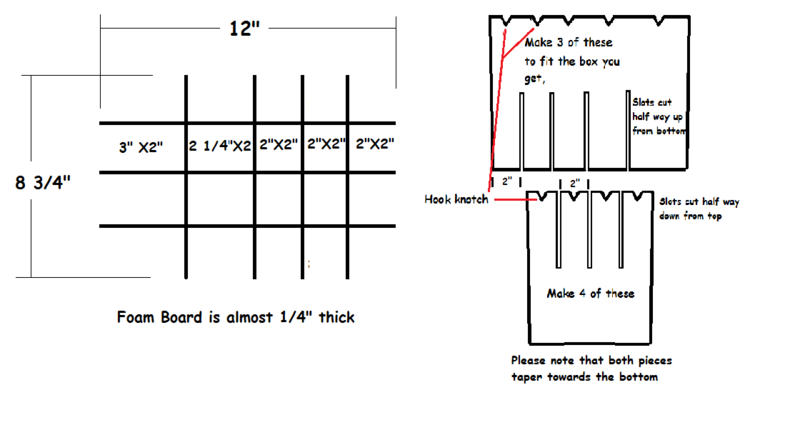 Then I figured out how many slots in the box I needed to make the size of holes I needed for the baits. I made mine wider on one side to accommodate extra large lures and smaller on the other side to not waste space for the smaller lures. I made Mine 3 rows of 2” x 2” slots, 1 row at 2” x 2 1/4”, and the last row was 2” x 3”. This worked out very well and I could hang all but my very largest baits with ease. The foam board is almost a ¼” thick and makes up the rest of the measurements. Here is the basic idea of what the grid pattern will look like. I laid out each piece and cut it out with a sharp knife. I used a serrated kitchen knife as it seams to cut it the cleanest. Once you get all your pieces cut it’s just a matter of putting it together like a 3D jigsaw puzzle. Once you get it all together it will look like this. I test fit this again after it is together to make sure it slides in and out easy. That way if you drop a lure you can just slide it out to retrieve it then slide it back in. Here is the foam board insert with all the pieces put together and with it finished in the file box loaded with baits. I cut notches into the top of the foam so the tails of the baits don’t stick up and hit the lid and it keeps the baits in place better. I liked how this turned out so well I made a few more. I made one box just for all my large jerkbaits. Like Husky-jerks, X Raps. Ima Flit’s, Rouges, Megabass Vision and such. I labeled the foam board with the lure type to make it easier to find baits. Here is the foam with lures on it out of the box and a shot of it in the box. This will hold about 50 jerk baits without too much trouble. The Last box I made I put in the most time, but it turned out great. I made it for smaller crankbait. Because the box is 10” tall I decided to make a 2 tier box for this. Here is how I made the pieces. Since the box is 10” tall I cut the pieces apart at 6” to make the top tier and 4” to make the bottom tier. I laid the bottom tier out like all the others with the long pieces with the slot on the top and the short ones with the slot on the bottom. Then I put this together and test fit it in the box to make sure it slid in and out easy. The top tier was a little more complicated. I wanted a handle built into it so I laid it out as normal except the middle slot which I put on the bottom as to not interfere with the handle. The center piece I had to make the slots opposite of the others to make it fit. I put it all together except this last piece which I slid in from the bottom. Once I got the entire top tier grid complete, I added sides and a bottom to it to make it more durable as it would be lifted in and out a lot. I used some household super glue I got at the dollar store to hold this altogether. I made the grid pieces just a little smaller so when I added the sides it would still be loose and slid in and out easily. Here is the completed box with 2 levels. It will hold a ton of crankbaits and I think it will be a great way to keep your tackle organized. Both the top and bottom tiers will side out to make retrieving any lost lures and cleaning out the box easy. As you can see, the ability to configure these boxes to your personal angling needs make them a great do-it-yourself project. Add to that the big savings and personal satisfaction and I think you'll agree this is a winner D.I.Y. project!